What has bank capital ever done for us? Higher capital ratios are unlikely to prevent a financial crisis. This is empirically true both for the entire history of advanced economies from 1870 to 2013 and for the post-WW2 period, and holds both within and between countries. The authors of this column reach this conclusion using newly collected data on the liability side of banks’ balance sheets in 17 countries. 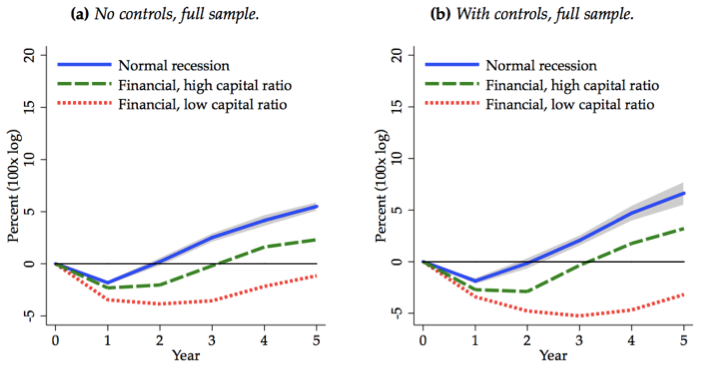 However, higher capital buffers have social benefits in terms of macro-stability: recoveries from financial crisis recessions are much quicker with higher bank capital. A well-run bank needs no capital. No amount of capital will rescue a badly run bank. The institutional response to the Global Crisis has centred on higher capital buffers and regulation of bank leverage. Bagehot’s quip, however, reminds us that the trouble might start when a bank decides how much to lend, and to whom: no amount of capital provisioning can make up for poor business acumen. This important debate can only be settled by empirical evidence. In recent years, long-run and cross-country perspectives have increasingly gained in importance and informed central debates in monetary and financial policy (Reinhart and Rogoff 2009, Schularick and Taylor 2012, Jordà et al. 2013). To our knowledge, our new paper is the first to bring a long-run perspective to the debate about capital buffers (Jordà et al. 2017). We ask two fundamental questions. First, what is the long-run relationship between capital buffers and systemic financial instability? Second, does more capital positively mitigate the social economic costs of financial crises? We answer these questions by constructing a new dataset for the liability side of banking systems from 1870 to today. The data cover three broad categories: capital, deposits, and other debt instruments, which we refer to as non-core liabilities. These data complement our prior measures of the asset side of banking systems (bank credit, in particular) and other macroeconomic data in Jordà et al. (2017). The combination allows us to study how bank leverage and other balance sheet ratios affect the probability and costs of systemic banking crises. Having a historical database that now encompasses both sides of banking-system balance sheets makes possible an evidence-based assessment of the competing claims made about solvency versus liquidity buffers in mitigating financial crises and their deleterious effects. Our first major finding is that bank leverage rose dramatically between 1870 and the second half of the 20th century. In our sample, the average country’s capital ratio decreased from around 30% capital-to-assets to less than 10% in the post-WW2 period (as shown in Figure 1 below) before fluctuating in a range between 5% and 10% in the past decades. This trend is visible across all sample countries, as we show in greater detail. Notes: Averages over 17 sample countries. The figure plots the shares of capital (blue), deposits (pink) and non-core (red) in total funding. Categories add up to one (100%). In a second step, we investigate whether the funding choices of the banking sector – the structure of the liability side of the balance sheet – are systematically related to financial instability. Theoretical predictions about this relationship are ambiguous. All else equal, a high bank capital ratio can be seen as a sign of a strong loss-absorbing buffer in the system, making crises less likely. But, on the other hand, more capital in the banking system could be associated with more risk-taking on the asset side of the balance sheet, making crises no less (and possibly more) likely. Whether or not bank capital is useful to spot financial vulnerabilities in the banking system is therefore largely an empirical matter. We find that the capital ratio provides virtually no information about the probability of a systemic financial crisis. This is in marked contrast to what happens with credit. Previous research (Schularick and Taylor 2012) found that loan growth (expressed as a ratio to GDP, on the asset side of the balance sheet) was the single most useful indicator of financial crisis risk among several other potential predictors. We begin our investigation by looking at the predictive ability of the capital ratio alone. Measured by this low bar, the capital ratio has nearly no predictive ability for a financial crisis. More formally, we also evaluate the marginal predictive ability of the capital ratio relative to the five-year change in the credit-to-GDP ratio. Here, too, we find this liability ratio offers very little additional information. Whether used singly or along with credit, higher capital ratios are associated, if anything, with a higher probability of a crisis. This mechanism is consistent with banks raising capital in response to higher-risk lending choices, rather than as a buffer against a potential systemic crisis event in the economy. In fact, as we know from recent experience, banking systems may appear to be well capitalised on the eve of crises. We also consider other features of the banks’ funding structure. The loan-to-deposit ratio can serve as a measure of aggregate maturity mismatch, or illiquidity, which can be a seen as a risk to financial stability (Farhi and Tirole 2012, Diamond and Dybvig 1983). We do find some evidence that higher levels and faster growth of the loan-to-deposit ratio are associated with a higher probability of crisis. We find similar predictive ability with non-core liabilities: a greater reliance on wholesale funding is also a predictor of financial distress, notably in the post-WW2 period when this funding source grows substantially. That said, the predictive power of these two alternative funding measures relative to that of credit growth alone is small. The tried-and-tested credit growth variable, which measures the risks taken on the asset side of banking systems, is still by far the best single indicator for macroprudential risk that policymakers should watch as a crisis warning signal (Schularick and Taylor 2012). Bagehot, it turns out, was right after all. In the third part of our paper, we ask a different question. The recent macro-finance literature (Brunnermeier and Sannikov 2014, Adrian and Boyarchenko 2012) has emphasised the central role of financial intermediary balance sheets and, in particular, leverage for asset prices and macroeconomic dynamics. With higher bank leverage, more capital or net worth is lost for a given shock to assets, in turn reducing intermediaries’ ability to extend credit, and increasing the likelihood of distressed fire sales (He and Krishnamurthy 2013, Geanakoplos 2010, Kiyotaki and Moore 1997). Following a similar logic, Adrian et al. (2014) show that book leverage of the broker-dealer sector has predictive power for asset prices. The costs of a financial crisis may accordingly vary with the leverage of the intermediary sector. We therefore examine these mechanisms empirically using our long-run data. Specifically, we study how bank capital modulates the economic costs of financial crises with local projections (Jordà 2005). Here we find that capital matters considerably: a more highly levered financial sector at the start of a financial-crisis recession is associated with slower subsequent output growth and a significantly weaker cyclical recovery. Depending on whether bank capital is above or below its historical average, the differences in social output costs are economically sizable. Real GDP per capita five years after the start of the recession is about 5 percentage points higher when banks are well capitalised than when they are not. This difference is displayed in Figure 2. Our long-run data thus confirm the cross-country findings in Cecchetti et al. (2011) and Berkmen et al. (2012) for the 2007 crisis and its aftermath. Like Cerutti et al. (2015), we find that macroprudential policy, here in the form of higher capital ratios, can lower the costs of a financial crisis even if it cannot prevent it. Note: This figure displays the path of real GDP per capita for the five years after normal recessions (blue) and financial crisis recessions with high (green) and low (red) bank capitalsation. Full sample results: 1870-2013, excluding world wars and 5-year windows around them. We introduced a new dataset on banking sector liabilities from 1870 to 2013 for 17 advanced economies. Banking sector capital ratios declined strongly before WW2, but thereafter stabilised. We then looked at how well capital ratios correlate with the probability and severity of financial crisis events. The message is nuanced. Higher capital ratios in banking systems can bring about more resilience – not of the banks per se, but of the wider macroeconomy. History does indeed lend some support for a precautionary approach to capital regulation. But the main role for bank capital appears to lie not so much in eliminating the chances of systemic financial crises, but rather in mitigating their social and economic costs – a distinct but arguably more important benefit. Admati, A R and M Hellwig (2013), The Bankers’ New Clothes: What’s Wrong With Banking and What to Do About It. Princeton University Press, Princeton, N.J.
Admati, A R, P M DeMarzo, M Hellwig and P Pfleiderer (2013), “Fallacies, Irrelevant Facts, and Myths in the Discussion of Capital Regulation: Why Bank Equity is Not Socially Expensive”, Rock Center for Corporate Governance, Stanford GSB, Working Paper 161. Adrian, T, and N Boyarchenko (2012), “Intermediary Leverage Cycles and Financial Stability”, FRBNY Staff Report 567. Adrian, T, E Mönch and H S Shin (2014), “Dynamic Leverage Asset Pricing”, FRBNY Staff Report 625. Berkmen, P S, G Gelos, R Rennhack and J P Walsh (2012), “The Global Financial Crisis: Explaining Cross-Country Differences in the Output Impact”, Journal of International Money and Finance, 31(1), 42–59. Brunnermeier, M K, and Y Sannikov (2014), “A Macroeconomic Model with a Financial Sector”, American Economic Review, 104(2), 379–421. Cecchetti, S G, M R King and J Yetman (2011), “Weathering the Financial Crisis: Good Policy or Good Luck?”, BIS Working Paper 351. Cerutti, E, S Claessens and L Laeven (2015), “The Use and Effectiveness of Macroprudential Policies: New Evidence”, IMF Working Paper 15/61. Diamond, D W and P H Dybvig (1983), “Bank Runs, Deposit Insurance, and Liquidity”, Journal of Political Economy, 91(3), 401–419. Farhi, E, and J Tirole (2012), “Collective Moral Hazard, Maturity Mismatch, and Systemic Bailouts”, American Economic Review, 102(1), 60–93. Geanakoplos, J (2010), “The Leverage Cycle”, NBER Macroeconomics Annual 2009, 24, 1–65. Haldane, A G (2011), “Capital Discipline”, Remarks Based on a Speech Given at the American Economic Association, Denver, CO, 9 January. (http://www.bis.org/review/r110325a.pdf). He, Z, and A Krishnamurthy (2013), “Intermediary Asset Pricing”, American Economic Review, 103(2), 732–770. Jordà, Ò (2005), “Estimation and Inference of Impulse Responses by Local Projections”, American Economic Review, 95(1), 161–182. Jordà, Ò, B Richter, M Schularick and A M Taylor (2017), “Bank Capital Redux: Solvency, Liquidity, and Crisis”, CEPR Discussion Paper 11934. Jordà, Ò, M Schularick and A M Taylor (2013), “When Credit Bites Back”, Journal of Money, Credit and Banking, 45(2). Jordà, Ò, M Schularick and A M Taylor (2017), “Macrofinancial History and the New Business Cycle Facts”, NBER Macroeconomics Annual 2016. Forthcoming. Kiyotaki, N, and J Moore (1997), “Credit Cycles”, Journal of Political Economy, 105(2), 211–248. Miles, D, Y Yang and G Marcheggiano (2013), “Optimal Bank Capital”, Economic Journal, 123(567), 1–37. Reinhart, C M and K S Rogoff (2009), This Time is Different: Eight Centuries of Financial Folly. Princeton University Press, Princeton, N.J.
Schularick, M, and A M Taylor (2012), “Credit Booms Gone Bust: Monetary Policy, Leverage Cycles, and Financial Crises, 1870–2008”, American Economic Review, 102(2), 1029–61. Banking industry representatives emphasise that higher capital requirements reduce the availability of credit, while Admati et al. (2013) and Miles et al. (2013) argue that there are no social costs associated with higher capital ratios. Significant increases in regulatory capital are therefore desirable.